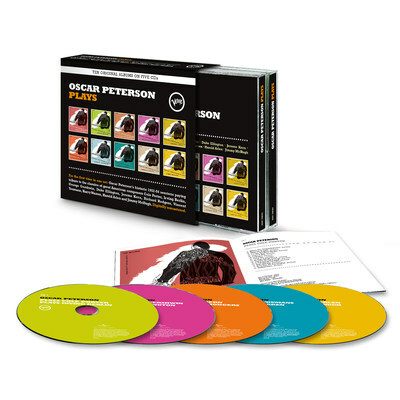 For the first time, famed jazz pianist Oscar Peterson's historic 1952-'54 series, Oscar Peterson Plays, has been assembled in total, collecting 10 albums across a five-disc, 113-song digitally remastered collection. Containing many of Peterson's most important recordings as a leader, these albums explore the canons of songwriters Harold Arlen, Irving Berlin, Duke Ellington, Jerome Kern, Jimmy McHugh, Cole Porter, Richard Rodgers, Harry Warren and Vincent Youmans—in the setting of the Oscar Peterson Trio. Oscar Peterson Plays, which has been digitally remastered, is available now via Verve Records/UMe. Few piano giants in jazz history, if any, scaled the heights of technical brilliance as Oscar Peterson (1925-2007). He was a ten-fingered player whose speed, execution, imagination and harmonic brilliance left other keyboardists with their mouths open. Peterson's prolific trios—with guitarists Barney Kessel and Herb Ellis and bassist Ray Brown — set a longtime standard for ensemble interaction and excellence. As his biographer Gene Lees said: "Oscar Peterson is an astonishing example of what the human body and mind can be self-disciplined to achieve." Peterson was a virtuoso but he was also an extraordinarily versatile accompanist and ensemble pianist. He recorded nearly 200 albums as a leader, as well as with Louis Armstrong, Count Basie, Nat 'King' Cole, Roy Eldridge, Ella Fitzgerald, Stan Getz, Dizzy Gillespie and Charlie Parker, just to name a few. Whether it was on the Jazz at the Philharmonic tours or the multitude of studio dates for the Verve and Pablo labels, Peterson was truly the bedrock of Norman Granz's success as the most successful impresario in jazz history. Granz knew that Peterson had a seemingly bottomless well of creativity, and that he could be counted on to bring something special to each of his composer-themed albums. Yet Peterson was assiduously faithful to the themes of the various composers—he improvised without altering the intended melodic lines. And while Kessel, Ellis and Brown may not take a lot of solos, listen for the melodic content that they invest into their roles as rhythm section players.